It’s no secret that we like diamonds; not only for their appearance but also for their uses, as they are one of the hardest natural material out there. But where do these gems come from? There are two sources: natural and man-made. 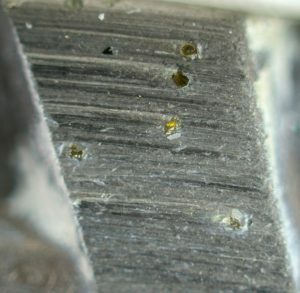 On a small-scale a diamond is formed from carbon. 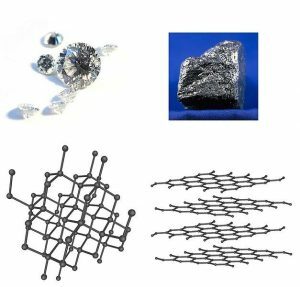 So, the basic parts of the graphite in a pencil and diamonds are made of the same stuff yet they are very different in terms of properties. 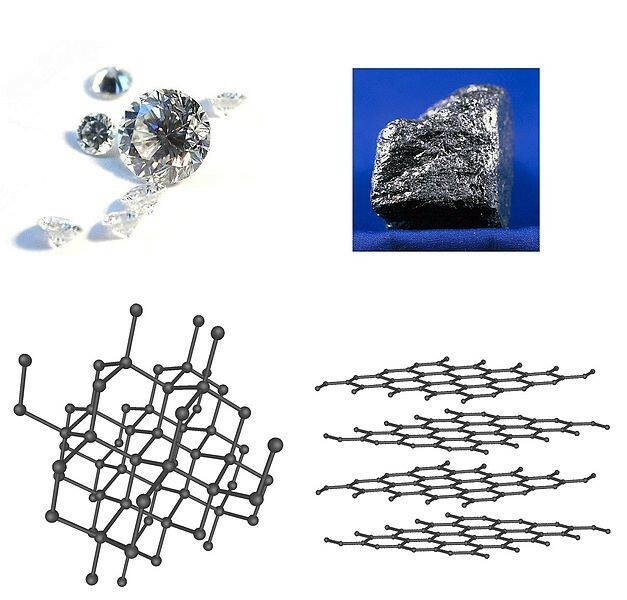 Graphite is slippery, soft and conducts electricity and diamonds are hard, shiny and clear. These differences form from the way that the atoms, the very building block of everything, are organized. For the sake of time, the essence of the idea of bonding is that atoms will “bind” to each other. With carbon atoms, a simple atom can only bind to other atoms 4 times at most. In diamonds, the atoms form full 4 bonds and form a large structure organized structure; that we call a diamond. While in graphite they form 3 bonds and are split into layers that slide over each other, so when you write with a pencil there are bit of graphite on the paper. The story starts deep underground, about 150km, and clumps of carbon are trapped. The conditions are terrible the carbon is under a lot of pressure and it’s very hot. These are the conditions that form as the carbon’s structure changes a small-scale. Wait for a little under a billion years or possibly over 3 billion years (no really, they are that old) the diamonds have found their way to the surface. The diamonds had gotten to the surface deep volcanoes erupting and carrying up chunks of rock with them; rocks that can contain diamonds. Then it’s just a matter of digging them out and turning them into rings. There are 2 main methods of producing diamonds in a lab, usually over a few weeks (very quickly by comparison to natural diamonds). HTHP: High pressure, high temperature. Mimicking the natural way diamonds are made using a diamond “seed” in the middle and graphite around in the pressure and temperature, with a bit of electricity, cause the structure to change into the diamond with help thanks to the “seed”. CVD: Chemical vapor deposits, where the “chemical vapor” is just means that the carbon being taken to boiling points and turned into a gas. How do you turn carbon into a gas? Simple, using microwaves. Also using a diamond “seed” when the atoms are in a vapor they start to build up the diamond structure. That’s how you can cook up your very own diamond sheets. Although they are not made naturally; man-made these diamonds are not “fake”, they still act the same as “real” diamonds and usually even come out with less imperfections that the real deal. The main difference between them is the way they are formed (man-made diamonds take a lot less time to form) and their price (man-made diamonds are cheaper). The ability to produce our own diamonds means that we can exploit them as building material. Diamond is one of the hardest substances on earth so they can be used to make things like drills and saws. Being able to create our own diamonds has influenced how we can operate. Next Next post: Could a Little Poisoning Save a Life? In general no, lab grown diamonds are cheaper; still not “cheap” by any stretch of the imagination but they do often cost less. Bear in mind the process of making them becomes more and more expensive the larger the diamond get, so it’s mainly economical more smaller diamonds. Still a diamond’s a diamond. Lab grown diamonds! So romantic! If I wanted to buy a lab grown diamond ring (for myself, haha), would it cost the same as a natural diamond?